For 31 years the Lotus Festival in Echo Park was one of the highlights of summer. Founded by an Asian community group, the festival took place at Echo Park Lake with its abundance of lotus flowers in bloom, providing two days of fun in the park, with dragon boat races, music, food stalls and entertainment to visitors of all ages, genders and nationalities. 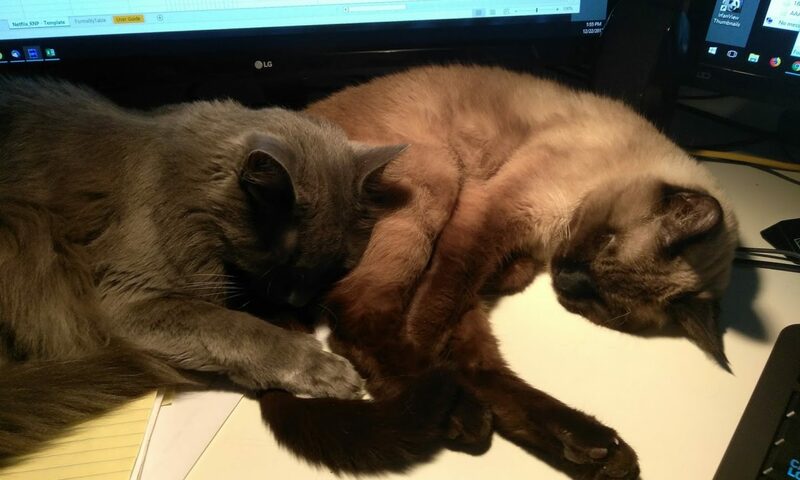 The lotus beds died first. By 2004 they started to look severely damaged, by 2007 only a few plants were left, which did not bloom in time for the festival. 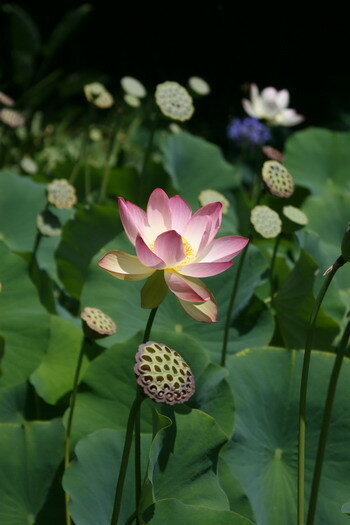 Speculations were rife – bad water quality, overall pollution, chemicals, theft, an unknown pest, but no real reason for the death of the lotus beds was named. In 2008 all that was left were a few dead plants, a sad sight for those attending the festival which still took place. This year marks the death of the Lotus Festival. It was canceled. No lotus, no festival, right? Part of the reason was also that the original organizers could not get the funds together for a festival at the former scale. R.I.P. Lotus Festival. The neighborhood Chamber of Commerce tried to put together a similar event, no longer called the “Lotus,” but the “Midsummer Festival,” which took place on June 11th. Few visitors came; no wonder – without the lotus flowers and the dragon boat races the main attractions were gone. 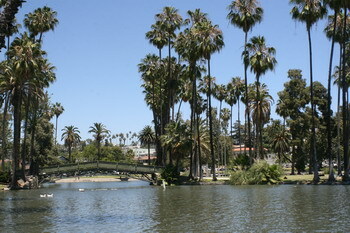 Echo Park Lake is still a small oasis in the middle of a bustling and sometimes rather rough neighborhood. 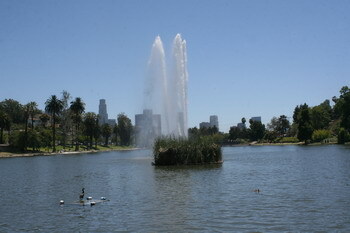 The City of Los Angeles is planning to refurbish the park next year. A replanting of a lotus bed is being discussed. All these plans are laudable, but I personally doubt that they will be put into effect; money is tight and other projects might have to come first. I am afraid that the lotus blooms and the Lotus Festival will fall into the category of things to be remembered fondly and with quite a lot of sadness as something which was beautiful and is now gone. I think CA will end up legalizing marijuana as one way to raise revenue. Things are pretty grim out there. I have to laugh at Georgetown, too. We call ourselves “The Red Poppy Capital of Texas”. You would be hard pressed to find a stand or two of poppies in the spring. Mostly, people will grow a patch of them in their yards. We see a few, but no great fields of them. There’s a program underway to plant a lot of them along the freeway that cuts through town. This time, the city is working with TXDOT. Last time the poppies were planted on the highway, the state mowed them when they mowed the ROW in spring. The poppies didn’t get to go to seed, so they never came back. Maybe with the state’s cooperation, we can get them going this time. I am very excited about it. If there are enough donations to get it going, it will be beautiful. I donated enough for two pounds of seed. Our state flower is the golden poppy; and yes, they do grow everywhere along the highways. LOL. No. The only poppy that’s native to Texas is the Texas poppy, which is a tall plant with a large white flower which has papery petals. The leaves and stalk are very bristly. The state flower here is the Texas Bluebonnet, which is a true-blue lupine. As in CA, they grow all along the highways here and bloom in spring. It’s a glorious sight. The highway department has planted them along the interstates, and plans their mowing schedule around the seeding time of the bluebonnets.